The perfect socks for the Groom - Just "In case you get cold feet" personalized with the wedding date! 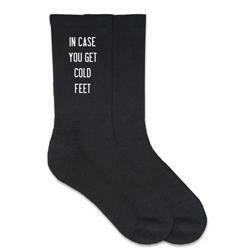 This fun and funny wedding gift idea printed on our men's black dress socks is a great wedding attire accessory! Please enter the wedding date to be printed on the socks in the notes section at checkout. Orders with missing information will take longer to process. Very pleased with the purchase... socks are adorable - my groom loved them! And I placed the order a bit late, so I was pleasantly surprised at how quicklime they came, since they were personalized. Would recommend!